Tom van de Beek of I Love Beeing is working on durability, the climate and our food for fifteen years now. Everything in nature is connected, and once he knows that something disrupts this balance, he can’t ignore it any more. It’s impossible to be completely consistent though, there are to many things – think of computers or mobile phones – that you do need but where the production isn’t exactly responsible. I don’t think you should make a big fuss of every unsustainable aspect of your life. As long as you control the things that are within your reach. One of the things he can control is the bee. And because the bee plays a special role in our food supply, he started I Love Beeing. Via a sticker campaign on all the Appelsientje bottles and his website, he draws attention to the problem and offers a course in urban bee-keeping to introduce people to keeping bees in the city. The course is given by Geert van Kerckhoven. He also runs BeeCare Amsterdam. 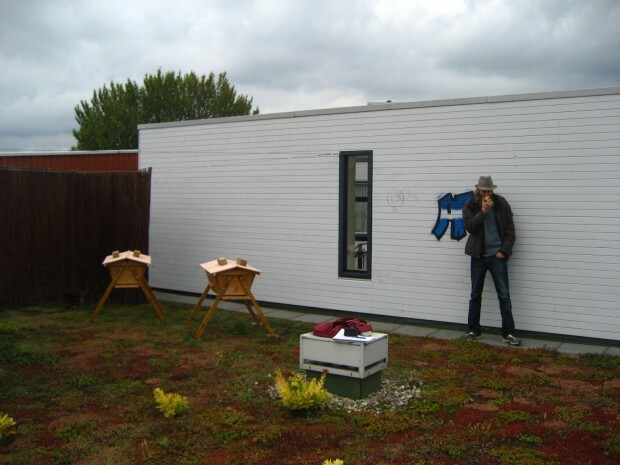 Urban bee-keeper Geert quit his job as concept developer for interactive TV three years ago. After wandering around a bit he decided to focus on ‘natural urban bee-keeping‘. Natural bee-keeping means that he doesn’t use pesticides for the varroa mites and that the bees can keep most of their honey. Geert keeps his bees on the roof of an apartment building in the Staatsliedenbuurt in Amsterdam. It’s popular to grow your own food and his bees are an important link in the gardening project on the so called GWL-terrain, an ecological district in Westerpark. The bee ensures the reproduction of nature. Humans are exploiting the creature for a long time. That’s why I decided to give something back. The bee is responsible for the reproduction of three-quarters of the different species of fruit and vegetables. Thirty percent of our daily food depends on the bee. Since a few years the European honey bee is heading towards extinction. Science hasn’t determined the main cause of death. But the parasitic varroa mite, a smaller habitat, the use of pesticides in agriculture and an unbalanced diet of sugar water instead of honey, seem to have a huge impact on the little fellow.